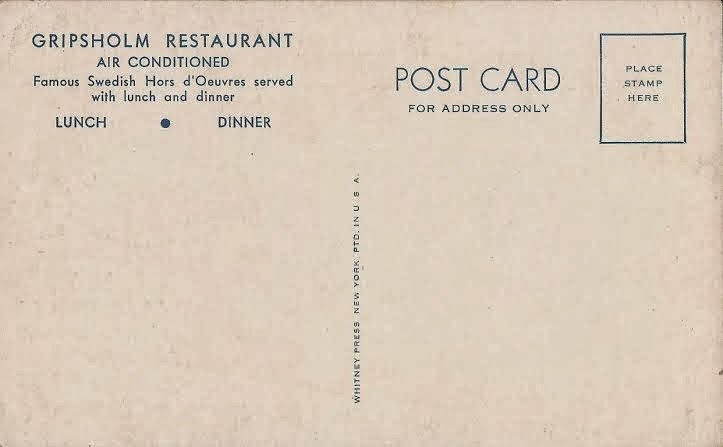 I've posted in the past about old restaurants of many stripe: Italian, German, Spanish, Chinese, steakhouses, chophouses, society joints, cafeterias, etc. Swedish restaurants, not so much. 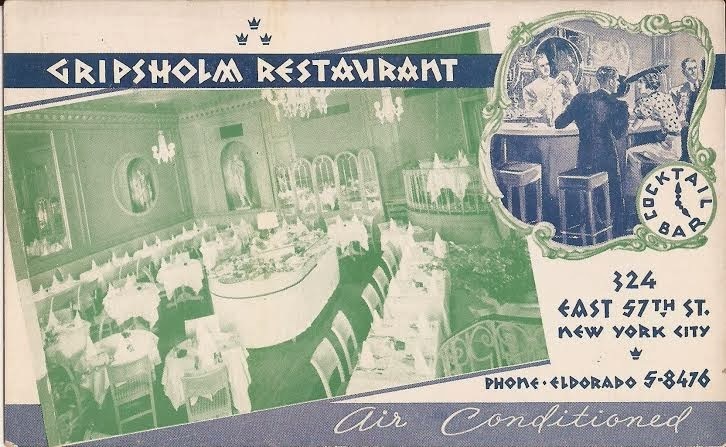 A reader sent me this photograph of the Gripsholm Restaurant, which lived on E. 57th Street in midtown Manhattan. The postcard is from the 1930s. It looks pretty elegant. And I love the little bar set up for "Cocktail Hour" (which we see, by the hands of the clock, is 5 p.m.). I am intrigued that the most famous feature of the Gripsholm was its "Swedish Hors d'Oeuvres." "Swedish Hors d'Oeuvres" means smorgasbord. And Gripsholm was famous for theirs. "It goes without saying that an appetite for hors d'oeuvres is a prerequisite for true enjoyment of a Scandinavian meal." The same article says that the Gripsholm's smorgasbord featured, yes, pickled herring. Also, eel, salmon, fish canapes, cold cuts, head cheese, pig's feet and "the salads." Then, there were the "hot foods": boiled potatoes flavored with dill, egg and salmon, fish balls, etc. All this for $1.50. The restaurant was also famous for its crawfish, which were cultivated in the brooks of not Sweden, but Wisconsin. Gripsholm was owned by Ragnar Asplund, formerly manager of the Swedish Rathskeller. It catered to a well-heeled, Sutton Place crowd. The Danish royal family dined here in 1939, after attending the World's Fair. And Ethel Merman, too, at some point. I don't know when it closed, but it was still around as late at 1978. Mr. Chow occupies the space once held by Gripsholm. 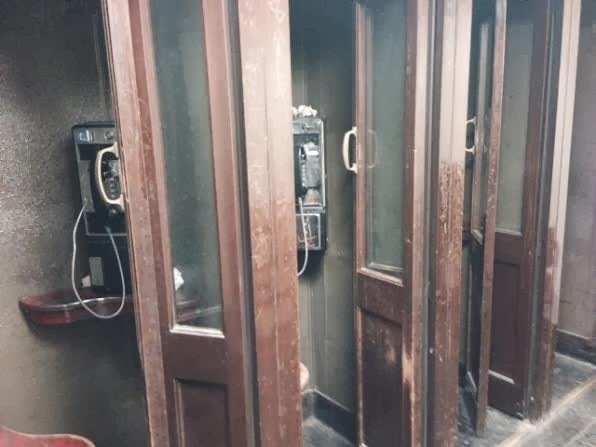 A reader sent me a photo of these booths. They rest on the second floor of Supreme Court, Queens County, at 88-11 Sutphin Blvd. The reader describes it as "a nice old WPA built courthouse." My father was one of the chefs for Longchamp's. He worked there from around 1940 to 1952, where he had a heart attack and was disabled after that. I believe he worked mainly at the one on 79th street in NYC, however, I seem to remember him going to help out at 34th and 59th street. It is a little vague since I was born in 1940. His name was John Motta. I do remember when I was about 8 or 10 he had come home one day and said he had been promoted to head chef. He had created several recipes for the restaurant and one I would like to get my hands on was for a special vinaigrette sauce, thick with finely chopped peppers, onion, garlic and basil. On my birthday, he would buy and bring me home their special Hazelnut cake with the mocha icing and of course once or twice I got one of their dolls that the restaurant sold for a birthday or Christmas. Reading about this brings back memories. He sang opera at home and loved Enrico Caruso and even tried out at the Metropolitan Opera. Which makes me wonder: Dolls? How can I get a Longchamps doll? If you're interested, here are some of my past posts on Longchamps.